This weekend we are heading with some good friends to a part of Texas we've never visited. 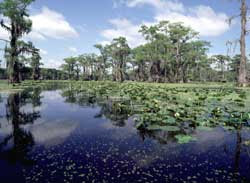 There are tons of Cypress trees with moss and swamp-like waters. I'm not sure how I will like this kind of lake. I've heard its beautiful and so peacefully relaxing. But, I keep trying to imagine laying out in the sun on a dock over waters such as these. With an occasional Jurassic Park leftover like an alligator. Will that even be a possibility??? Geeze, I hope not. You know, most times when I go to a lake I float on a raft or something so I can stay cool while catching some rays. Or I take a dip when I have to pee. (Gross, I know... but come on, everybody does it, right???) But, I'm questioning if getting in this type of lake is an option at all. Where will I pee? The couple who is leading our retreat has been to this place many times as the fella's parents own the lake house we'll be staying at. Since I have never been there I have tons of questions about amenities such as bathrooms, is the dock within walking distance from the hacienda, and what kind of coffee is available. Shallow questions, I know. Especially considering just last month I lived in a tent for a week and had to carry a fly swatter with me as I trekked around our camp site. I am confident the living quarters will be much better than my "roughing it" ones were. But, I'm one of those gals who doesn't do too well with ambiguity. I like to know what to expect. I'm working on this so that I can become a more spontaneous free-spirited kind of person. So, I'll be back in touch Sunday night to let you know how this adventure turned out. I'm counting on it being a ton of fun, no matter if I can dip in the water or not.